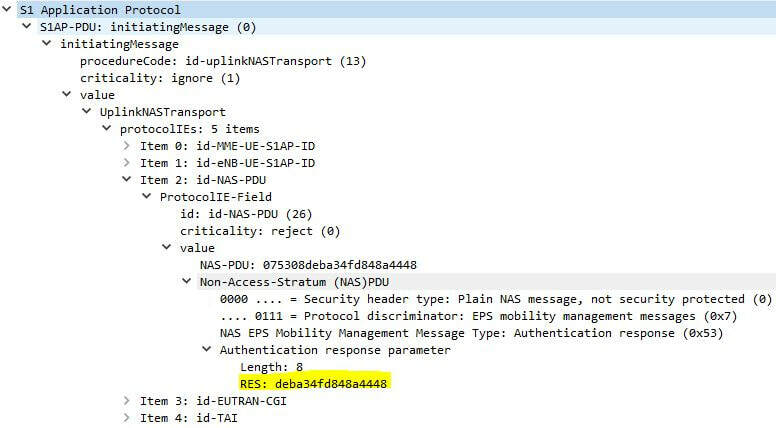 LTE EPS AKA (Authentication and Key Agreement) procedure is used to perform mutual authentication between the UE (User Equipment) and the LTE network. 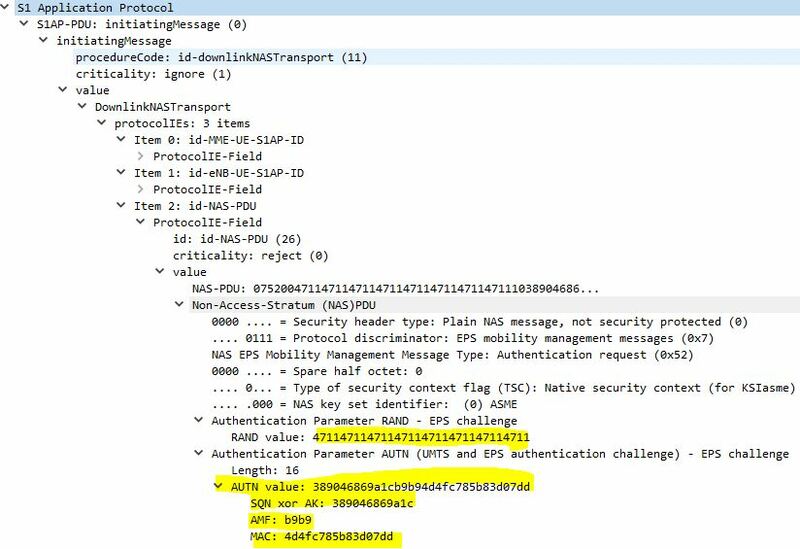 Illustrated below is a Wireshark trace of the Authentication procedure between the UE and the MME. SN_ID is the ID of the UE's serving network. Kasme is used as the top-level key generated independently by the HSS and the UE. 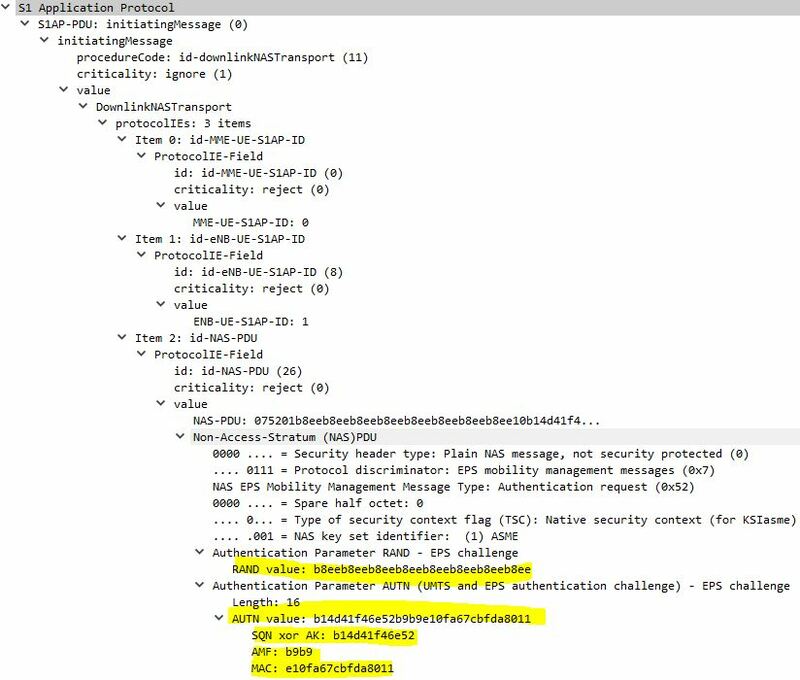 Once mutually authenticated, Kasme is an entity that receives top-level key(s) for NAS and AS security setup via Security Mode Command/Complete messages on NAS and AS, which are not covered here. On the Wireshark trace, the initial EPS authentication challenge failed to authenticate the network at the UE. The failure is "SQN Failure" with EMM cause#21 for "synch failure", which indicates the SQN supplied by the core network in the AUTN parameter is out of range. As part of this message, the UE also include a re-synchronization token AUTS provided by its USIM, AUTS=SQN_MS xor AK (48 bit). By using this AUTS, the network can perform re-synchronization procedure which entails the MME to delete all unused authentication vectors for the IMSI and obtain new vectors from the HSS. Once the re-synchronization is complete, the network will initiate a new authentication procedure. 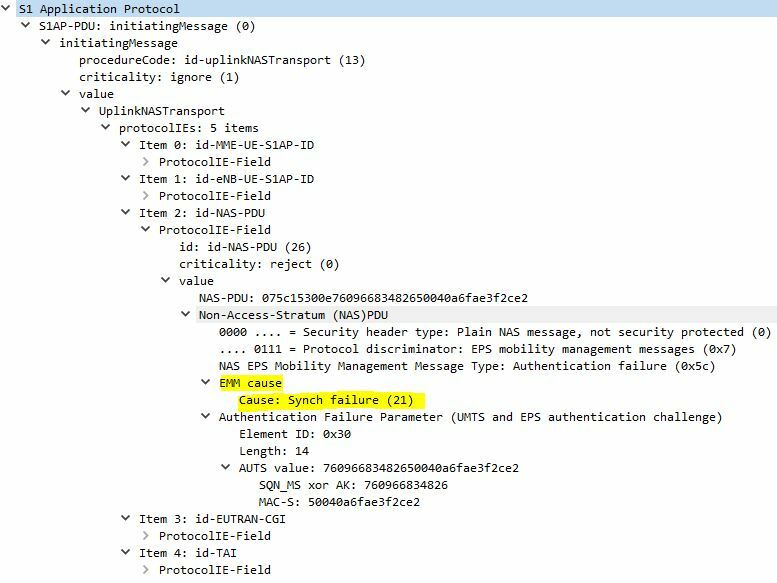 Note that if the network receives two consecutive EMM cause#2 "synch failure", it will terminate the authentication procedure by sending an AUTHENTICATION REJECT message to the UE. Authentication is successful when the XRES in the Authentication Response matched that of the MME.